It’s a challenge to walk around most parts of major cities like Boston, as well as surrounding smaller towns, and not see construction projects of some kind going on. Whether it’s a skyscraper in a major city, or a 2-story building being constructed in a small town, Massachusetts construction site accidents are always a major risk for the people who work at them. Construction scaffolding, of course, is central to any building construction project – the maze of steel frames and platforms enable construction workers to work alongside the building while – hopefully – staying safe. But it doesn’t always work out that way. These accidents can lead to extremely serious injuries, as most people could imagine. In the most unfortunate cases, scaffolding injuries lead to coma, paralysis, and even death. The Occupational Safety and Health Administration (OSHA) estimates that there are 2.3 million construction workers who regularly or frequently work on scaffolds in the U.S. Here in Massachusetts, there are thousands of construction workers, painters, window washers, and laborers who use scaffolding in order to complete their job duties on the worksite. It’s work that isn’t for those who can’t tolerate heights, and it isn’t easy. Scaffolding is a temporary vertical and horizontal framing platform, assembled from individual sections, that allows workers to perform their job duties at high elevations. This equipment is not only used by construction workers erecting new buildings, but is also frequently used by maintenance workers to perform preservation and cleaning work on existing buildings, such as brick work and glass cleaning. Art restorers also are also known to use scaffolding in order to restore artworks at museums. Scaffolding is almost universally constructed of steel and metal. Construction injuries involving scaffolding are frequently due to improper assembly of the scaffolding platforms, which cause them to collapse, and which result in workers suffering falls that can be devastating. Aside from work crews, pedestrians and passersby can be easily injured, if not by the actual collapse of a scaffold, then by falling debris from the scaffold platforms. Scaffolds are complex structures. They require specific and careful assembly to maintain proper balance and support the weight of workers and their building materials. Defective and improper footings, planks, braces, guard rails, decking and counterweights can eventually lead to scaffolding collapses and falls. The manufacturers who make this equipment, and the construction companies that use this equipment, know this. Electrocution from metal scaffolding coming in contact with power lines. Scaffolds are so dangerous that they are regulated by federal and state governments, and at the federal level, OSHA estimates there are more than 4,500 construction worker injuries yearly from scaffold accidents on construction sites. The National Census of Fatal Occupational Injuries (CFOI) cites an average of 88 deaths annually because of scaffold accidents. Because of this high safety risk, every individual on a worksite - including employers, supervisors, workers, and contractors - must comply with specific safety regulations. These include the required usage of correct fall protection equipment, such as lifelines, harnesses, lanyards, and safety nets. Despite all these regulations, serious injuries still occur. Why? A desire to minimize costs, haste to get the job finished, and simple inattention to safety. When this occurs, the inevitable result is often a worker suffering a serious personal injury or worse, a fatal injury. When a fatality results, a Massachusetts wrongful death lawsuit may be brought. Who is Liable for Injuries Resulting From a Massachusetts Construction Scaffolding Accident? 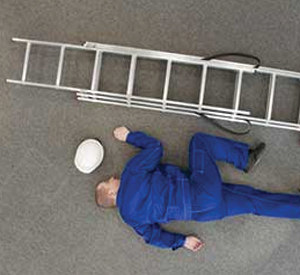 While ladders don’t require assembly and are not as intricate as scaffolds, many serious accidents can result from them, also. Ladder manufacturers like to point the finger of blame at anyone who uses their product, but the accident may not have been your fault. If you suffer a fall from a ladder, it is important that you contact a Boston Massachusetts ladder accident lawyer, because the law governing these types of injuries can become very complicated. These accidents can often be extremely serious, and the accident may have been due to some kind of design or manufacturing defect. If you’ve been injured in a Massachusetts scaffold accident or Massachusetts ladder accident, your next move is going to be a very important one. Have you -- or a loved one – suffered an injury due to a scaffolding accident or ladder accident? If so, click here to receive our FREE article, “The Top 10 Things To Do After Suffering An Accident Or Injury In Massachusetts.” This feature document contains useful information for people who are injured in a variety of Massachusetts accidents that are due to someone else’s negligence, including scaffolding and ladder injury accidents. It discusses recommended steps to take after being injured in an accident, and how to best protect your interests after your injury. The Law Offices of William D. Kickham & Associates is a “boutique” law firm specializing in ladder and scaffolding accidents, among other types of injuries. Our Boston, Massachusetts construction site accident lawyers know exactly how to investigate accident sites and determine what caused the accident. We have worked with many construction site injury victims, and are experienced in the sound legal strategies needed to recover the financial damages that injury victims are owed. Check out our legal successes by clicking here. If you have been injured in a scaffolding accident, and you wish to recover financial damages for your injuries, you will need an experienced and highly-skilled Boston, Massachusetts scaffolding accident law firm. Do not hire a firm that is not very experienced in this complex area of law: The results are likely to be very poor if you do. Whoever the potential defendants are in such an accident, they will almost be represented by top attorneys and a liability insurance company. Anyone “going up against” a liability insurance company and their lawyers, without an experienced Boston, Massachusetts construction site accident law firm, would be extremely unwise. The Law Offices of William D. Kickham has been representing victims of Massachusetts construction scaffolding accidents and Massachusetts ladder injuries for many years. Our experienced attorneys know how to find all the necessary evidence to support your case and seek the maximum possible financial damages on your behalf. While we have convenient office locations just off Route 128 in Westwood, Massachusetts or in downtown Boston, our firm also makes “house calls” and can travel to your home or hospital room to provide you with the answers you need. YOU WILL OWE US NO FEES UNLESS WE WIN YOUR CASE FOR YOU. Contact us at (781) 320-0062 or (617) 285-3600 or click here to send us a confidential email. We offer all of our legal clients an INITIAL FREE CONSULTATION of up to 20 minutes and will respond promptly to your email or call about your injury. If you get our voice mail message, leave us a detailed message and we promise to get right back to you. Massachusetts injury lawyer William D. Kickham is a professional legal commentator for a variety of prestigious media, which includes Court TV (now In Session on HLN,) Fox News TV-25/Boston, The Boston Herald, WBZ-AM Radio 1030, WCVB-TV5/Boston, Nightside With Dan Rea, Greater Boston With Emily Rooney, Money Matters Radio/Boston, and The Metro Newspaper/ Boston. Put that expertise to work for you in choosing your Boston, Massachusetts scaffolding accident lawyer or defective staging accident lawyer. You’ll be glad you did.